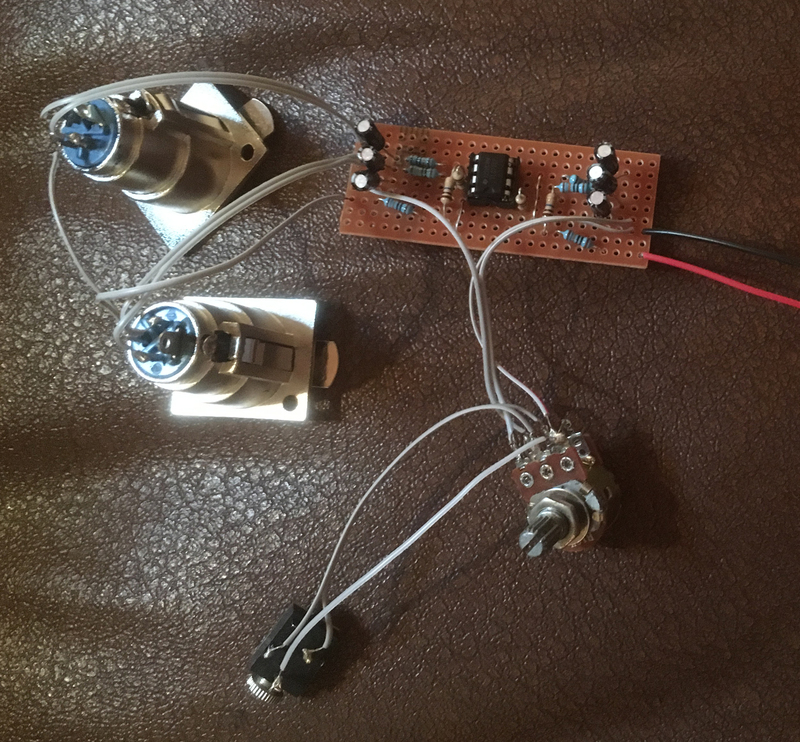 While making the piezo contact microphones described earlier in this series, I decided to adapt a couple of them for the specific purpose of recording sound underwater in rivers and ponds. In this case, I wanted them to be compatible with my Marantz PD660 recorder, which records in stereo via two XLR external microphone sockets. 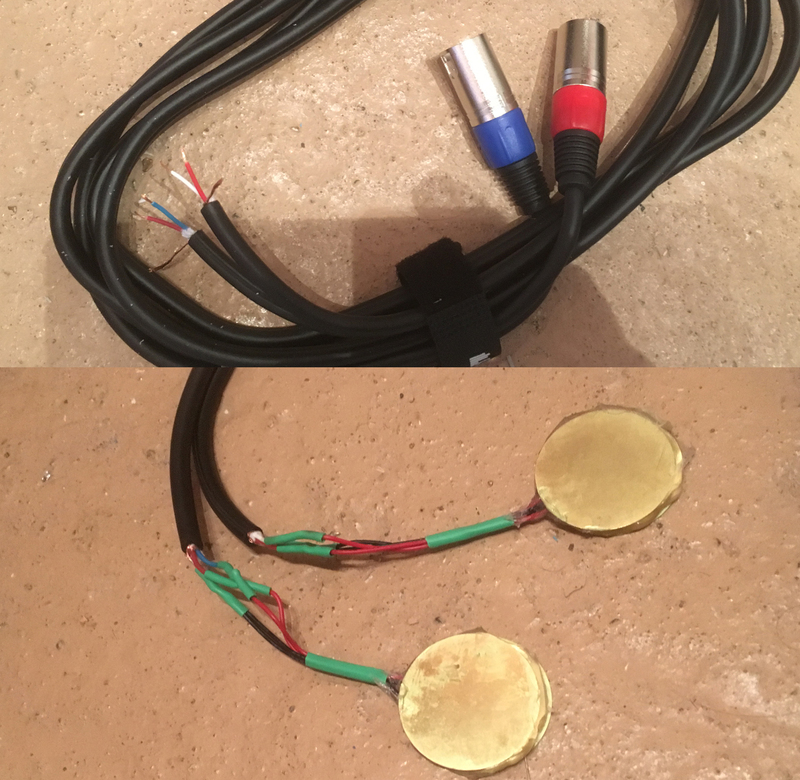 For my first attempt, I began by using 3m twin shielded cables, which had two 6.35mm mono jacks on one end – what was on the other end didn’t matter, as these connectors were cut off and the ends attached to piezo elements. As with the others, the shields were attached to the brass outsides, the cores to the centres, and they were given two coats of Plasti-Dip. In this way I was able to record in stereo, but my attempts were bedevilled by extraneous noise. I also realised that underwater recording required much greater amplification than I was getting from the simple preamp I had used for the simple percussion instruments I had been making. Looking around the internet to see what others had done, I came across the idea on this site of using two piezos back-to-back for each channel. Actually, this is probably more accurately described as front-to-front, as it requires the two piezos to be sandwiched together with flexible silicone sealant. Having read somewhere else that the air gap behind a piezo affects what it picks up, I decided it would better if there was some air between the two piezos, rather than completely filling the space between them with the sealant. Hence, I just put a ring of sealant round the edges before sticking the discs together. The main thing is to keep the centres of the two discs from touching. To connect the discs to the recorder, I used a 3m twin XLR cable. 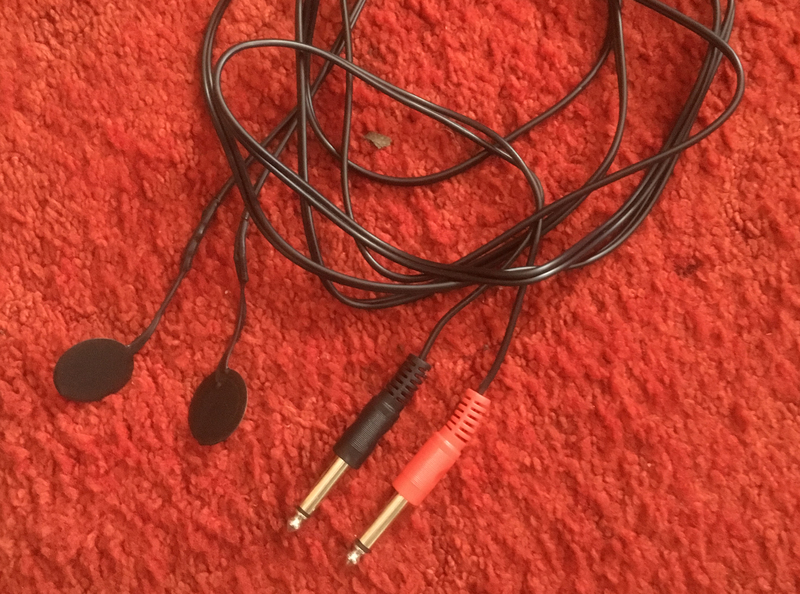 Each channel used two discs: the black leads from the discs were connected together, and the two red leads were connected to the left and right connectors of the XLR lead. In fact, I made two sets, to see if there would be a difference between 35mm discs and 50mm discs; the 35mm discs are shown above. The 50mm discs came with no wires attached, so I had to solder the wires on myself – a bit of a tricky job, to make sure they attached firmly, but without damaging the delicate central area of the disc with the crystals in it. 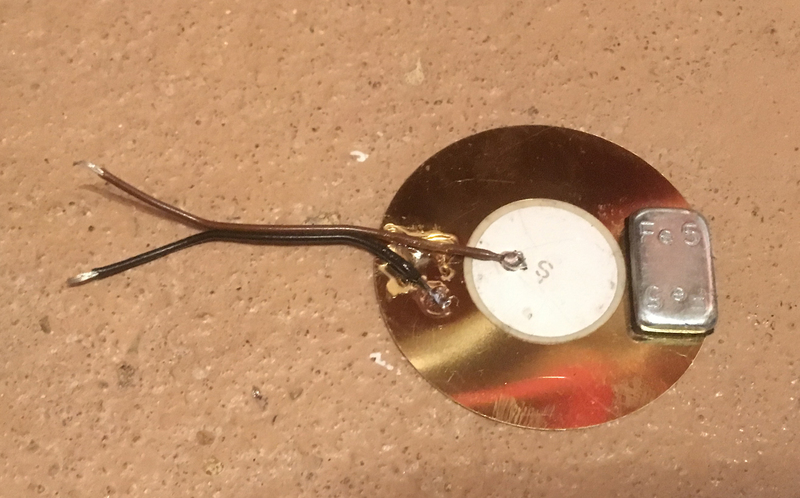 When I had done the soldering and checked the strength of the joint, I superglued the wires to the outer edge of the discs to make sure there would be no stress on the soldered joints which might cause the wires to become detached while in use. In the case of the 50mm discs, where there was more space, I stuck a small lead weight on the edge of one disc in each pair before putting them together. This, I hoped, would make them more stable in the water. Once again, I used the same principle of putting the sealant round the edges of the discs only, and then putting them together like a sandwich. I connected the wires to a twin XLR cable as before, and gave the discs two coats of Plasti-Dip. 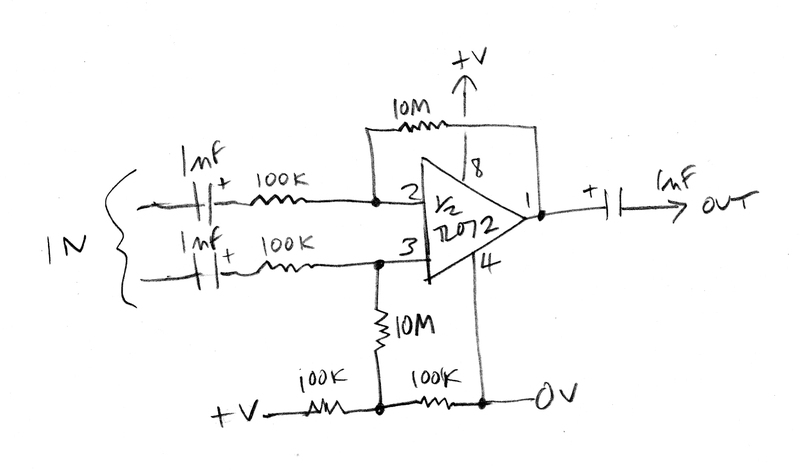 Firstly, it was designed to amplify the input signal by a factor of 100, with a volume control to reduce the output if necessary; secondly, it was in the form of a ‘differential’ amplifier, so that the signals on the left and right leads of each channel were amplified and added together, producing a simple two-channel stereo output from the four inputs. After checking the prototype (pictured above) was working satisfactorily, I improved the connections with 2 core shielded cable and put the circuit into a small box. I changed the output from the 3.5mm socket shown to a 5 pin XLR socket because this matched the professionally made apparatus I use for field recording with conventional microphones. There was no room for a battery in the box, so I used the 3.5mm socket for a power socket. 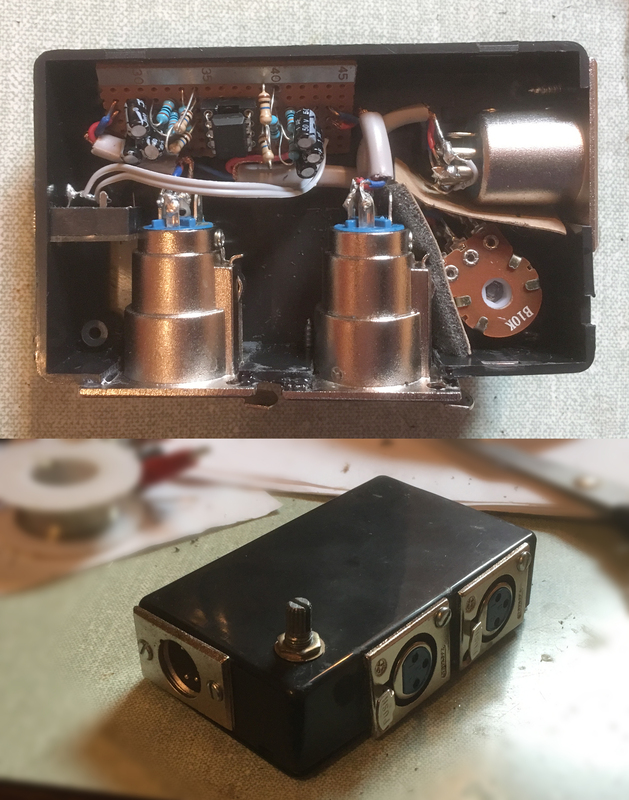 For absolute minimal noise, the closer the preamp is to the piezos the better, and I have seen designs where the circuit was contained in a waterproof housing in the water. However, mine is designed so the preamp box is well away from the water, and the output volume control can be used while it’s in operation, as well as the input volume control on the recorder. The first problem when it came to testing the hydrophones was how to ensure that they floated in the correct place; and the second was how to maintain a consistent stereo image. 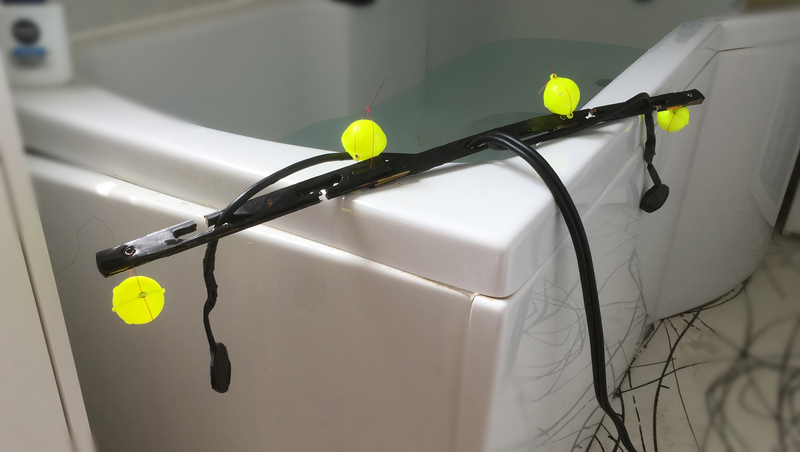 Clearly, the hydrophones would require some sort of framework to which they could be attached, and from which their depth underwater could be adjusted. The framework would need to be buoyant and, as I discovered, potentially very wide. The speed of sound in air is about 750mph or 350 metres per second, and a distance between the microphones of about 9-12 inches or 25-30cm is usually enough to get a satisfactory stereo image. However, underwater, the speed of sound is more like 1,500 metres a second, getting on for four and a half times as fast! This meant that the hydrophones would need to be spaced up to four and a half times the distance apart to get the same stereo effect as two conventional microphones recording in the open air. 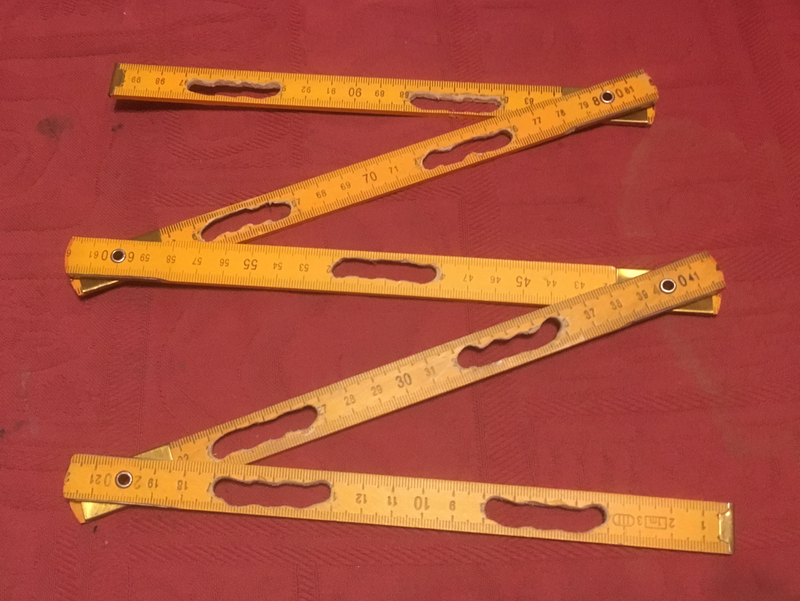 I thought about different methods of creating a frame 3 – 4 feet or 1 – 1.5 meters long, and easily foldable for transportation, and came up with the idea of using a folding wooden ruler. 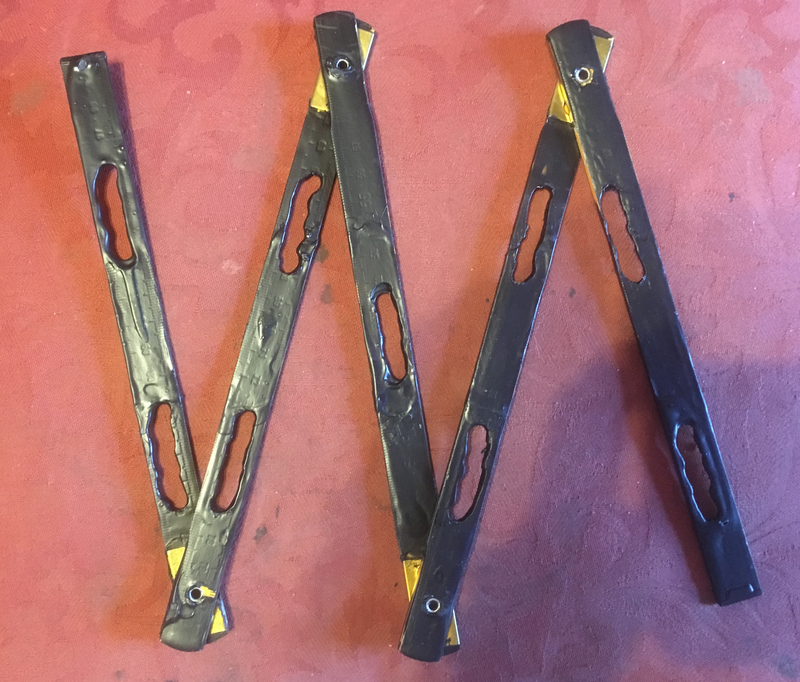 I found one which was a metre long, about the minimum necessary length, which folded on brass hinges into 5 sections of 20cm each. This would easily fit into a bag and could be carried to the recording site before being opened out and placed in the water. It cost about £2 (although postage was £3!). 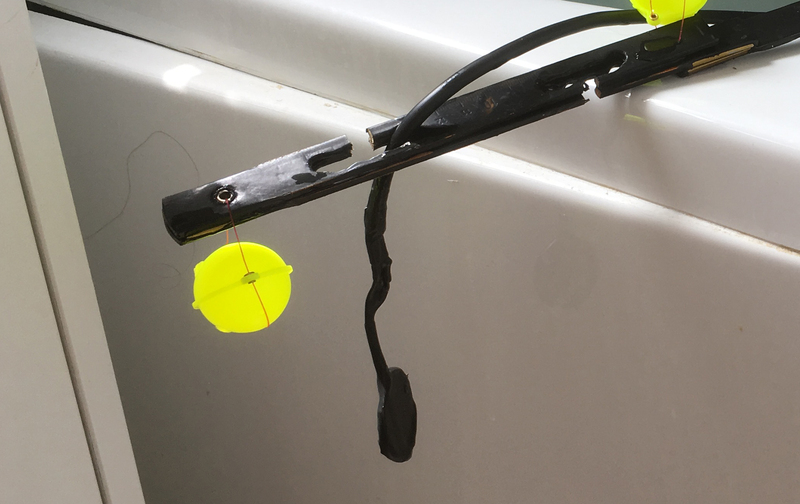 The purpose of these slots was so that the hydrophone leads could be threaded through them, stay in position, and allow the piezo elements to stay at the right depth in the water beneath the framework. and then – since I had the tin in the workroom – gave the framework a coating of Plasti-Dip. I’m sure it would have been fine without it, but the Plasti-Dip will hopefully give the wood a little extra protection, make it easier to dry and increase its life. 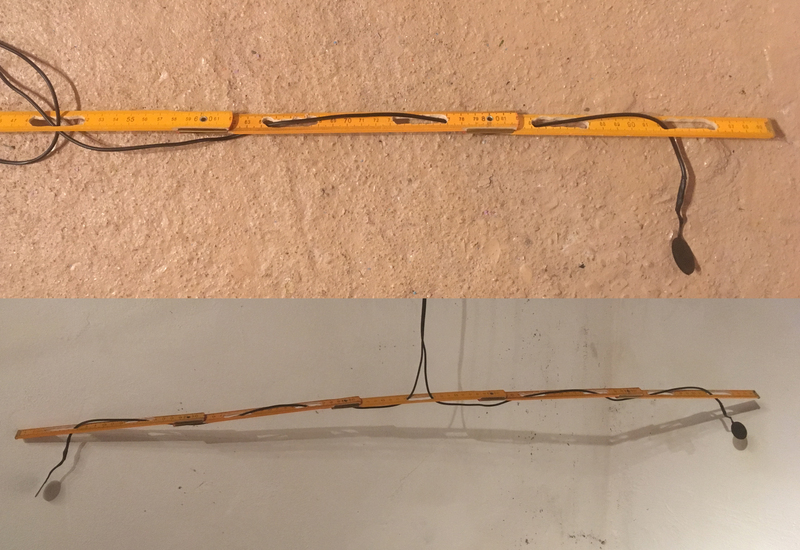 Later, because of using a wider construction with two piezos sandwiched together, I cut narrower channels to connect the slots to the edge of the framework, so the wires could fit in and the piezos wouldn’t need to pass through the slots. 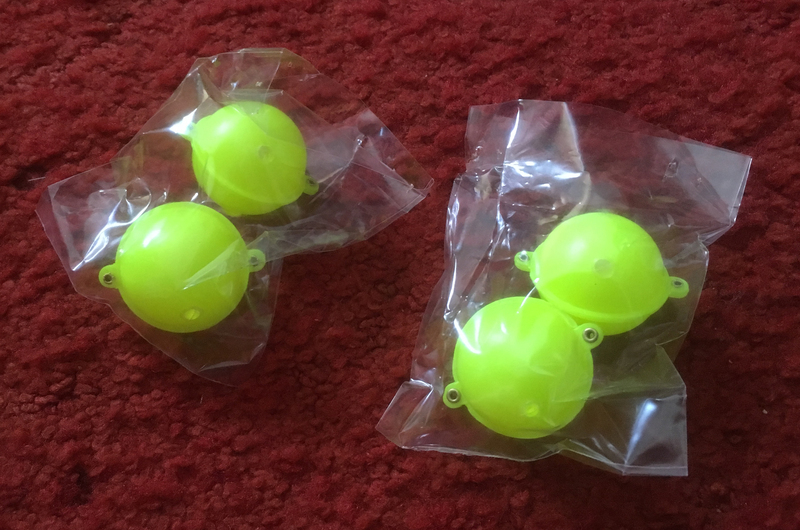 These are hollow plastic and have a small bung in them so they can be partly filled with water. This gives them a little weight so they can be cast into an ideal position in the water, but will still float. I thought these would ensure the wooden framework would remain on the surface and the hydrophones could be positioned at an appropriate depth beneath. In the end, I used them without any water in them; empty, they were able to support the framework slightly under the surface. As can be seen in the picture, in a restricted space such as a bath or small pond, the end sections of the framework can be folded in. I’ll post again when I’ve had a chance to try it out in the field! I’ve got a bed room(or 2?) packed with asst’d springs, tines,tin boxes, resonant bodies of the unlikely variety. I cant let go of a laptop-there’s like 12 asst’d mac 68xx, ppc,intel & dell toshibas ibm – that any good citizen would’ve discarded first chance — i was fiddling with a1st, 2nd gen IBM THinkpad earlier- its chock full of working music apps- those early freeware drum machines/groove box softs for Windows were pretty good. Glad you’re enjoying it – don’t dispose of any of the clutter yet, but plan some projects to use them creatively! I haven’t bricked my UCreate, but I might be thinking the same as you now – I wasn’t successful in replacing the original samples with my own, and I’m not still in touch with the guy who did all the work. I’ve got involved in a lot of piezo and electret projects this year – not sure what I’ll be getting into next!